In her first major policy address of 2018, Education Secretary Betsy DeVos criticized the education policies of the Obama and Bush administrations, and laid out plans for the future of education reform. DeVos has made school choice and reducing the role of the federal government in education two of her priorities as the Trump administration’s education chief. She also is working toward fulfilling President Donald Trump’s 2016 campaign promise to end Common Core—the education initiative that outlines what students should know in math and language arts at the end of each year of K-12 schooling. “I agree—and have always agreed—with President Trump on this: Common Core is a disaster,” DeVos said in recent remarks at the American Enterprise Institute. “And at the U.S. Department of Education, Common Core is dead,” DeVos added. 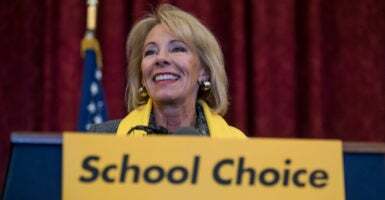 Even with the creation of the federal Education Department, she said, most classrooms today look “remarkably similar” to those of 1938, the year the American Enterprise Institute was founded. “Our societies and economies have moved beyond the industrial era, but the data tell us education hasn’t,” she said, contrasting it with how retail has changed over the past 80 years, from general stores to websites. Additionally, the Obama administration’s School Improvement Grants, which sought to fix targeted schools by “injecting them with cash,” cost $7 billion with little to show for it.